JumpStart 2015, Jan. 22-24 at the Marriott Atlanta Airport Hotel, will go down in First Financial Security’s history as the biggest and most game-changing event in the company’s 10 years of existence. 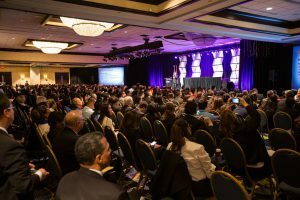 Throughout the two-and-a-half-day meeting, it was standing-room-only in the Marriott’s Grand Ballroom, as attendees frantically took notes, not wanting to miss what the next power speaker had to say. But, JumpStart also was an event punctuated by huge announcements, many of which had the power to transform lives, careers and the industry. If you were there, you know firsthand the electricity in the room as each major announcement was revealed. If you missed the meeting, here’s a quick recap of one of the most exciting events in FFS’ history. 1. New Vision and Mission Statements. As First Financial Security Co-CEO Debbie Gerlicher explained to the audience, FFS had inherited its Vision and Mission statements from the previous owner, but everyone associated with the organization knew one day those statements would change to reflect who the organization is and what it does for people. That day arrived on Sat., Jan. 24, when Debbie, First Financial Security President Meg Jones and CEO Phil Gerlicher announced the new Vision and Mission Statements, as well as discussed the company’s corporate culture. To help all people achieve financial security and peace of mind. 2. New Corporate Website. Director of Marketing and Communications, Laura Manzer, premiered First Financial Security’s dynamic new corporate website to thunderous applause. The new website reinforces FFS’ position as a forward-thinking, proactive company that is leading the way in the industry by ensuring everyone has access to the knowledge, products, strategies, and business opportunity to build a better financial future. Go to www.firstfinancialsecurity.com and check out the new content, videos, graphics, and much more. 3. LC15 – Changing the Face of Insurance. Director of Events and Recognition, Denise Langro, asked Laura Manzer back to the stage to announce details of the upcoming Leaders Convention 2015. Laura explained this year’s theme plays a pivotal part in the company’s identity and goes hand-in-hand with the organization’s newly announced Vision and Mission statements. The event is planned for the M Resort Hotel in Las Vegas, July 16-18, 2015. Denise announced online registration would open shortly. Check your FFS-Leaders website often for the latest details. 5. A Second Proprietary Product: Life Scope. Representatives of National Life Group, one of First Financial Security’s premier carriers, took the stage to make an important announcement. In addition to acknowledging the 10th anniversary of FFS’ relationship with the major carrier, Executive Vice President, Ruth Smith and Vice President of Strategic Accounts Dave Gilmore unveiled a second proprietary product (FFS’ first proprietary product is ANICO’s Life 360°). Life Scope IUL, created specifically for First Financial Security, offers innovation for clients and represents NLG’s commitment to shrinking the submission-to-commission time frame. VP of Sales Management Michael Hardin reminded the crowd how rare it is for an organization to have not one, by two proprietary products created by two independent provider companies. It showed the providers’ confidence in First Financial Security and its field force. To learn more about these announcements and other JumpStart 2015 highlights, please go to your associate back office. To see photos from this important event, go to First Financial Security’s Facebook page and click on the galleries found there. Be sure to like, comment on and share the photos with your Facebook followers. And if you missed JumpStart 2015, make sure you register and attend all First Financial Security events and meetings this year. The company is moving forward at break-neck speed. Don’t get left behind! Build your business and team from event to event.